A couple of months after Evie's initial diagnosis I realized it was about time to start thinking about funeral and memorial plans. I had no idea where to start. How does one plan a funeral for an infant? It seems quite unnatural for the words infant + funeral to be combined together in one sentence and yet here I was facing it head on. My first stop was Pinterest. I wasn't even sure what words to type into the search bar. I tried any and all combinations of infant loss, funeral, memorial, planning an infant memorial, etc. etc. but really could find no helpful information, let alone any ideas for adding cuteness to an otherwise grim event. In light of that experience it has come to my attention that Pinterest, and just the internet in general, is in need of some information on how to plan an infant funeral and memorial. And so I have decided to share as many details as I can remember on how we planned a funeral and memorial service for my sweet Evie - the process, the places, the special touches, everything. My hope is to be a helpful and practical resource to any mama out there having to plan a funeral and/or memorial for her child. For such a painful task, eliminating the guesswork factor has potential to be quite a blessing. I plan to make this a four part mini-series this week: The Funeral, The Memorial Service, The Memorial Service: Special Touches, and Remembering Your Baby at Home. The last day I hope to do an open link-up for mommies who have lost babies to share the special mementos they keep around their home to remember their little ones by. I hope and pray this series will be a blessing to many. I bet this will be so helpful to so many! Praying for you as you put it together, and praying for the people who will be needing this! You are wonderful, Sarah, and so thoughtful. Having an adoring and creative mom sure helps, too. Thank you for putting this together. 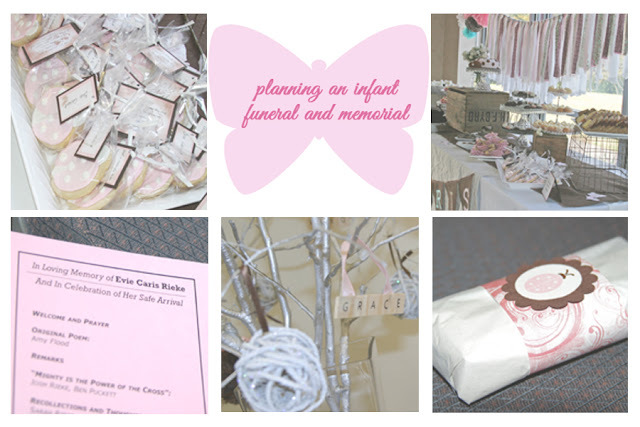 I'm in the process of planning my daughter's funeral, while I wait for her birth. It's a heartbreaking thing no parent should have to go through. And you're right, there isn't enough on the internet to help families wade through something like this! Thank you for this...I had a hard time this evening searching for infant funeral ideas, overwhelmed by having to make decisions and then I found this post. I am eager to read the series and hope it will help me plan a service for my baby boy. Thank you so much. This has been so helpful for planning for my sweet girl. I just didn't know what to think or where to start. I'm so sorry you have to plan anything like this at all. My deepest sympathies. Please email me if I can support you in any way (sarahjrieke@gmail.com) <3 Much love and many prayers.